Bridged mode is really important if you plan on using your VMs for any sort of server. In NAT mode they will not be able to communicate with any other machines on your local network. Bridged mode makes it so your VMs share the physical interface of your KVM host. That's it. You can now start using your new bridge with your VMs. 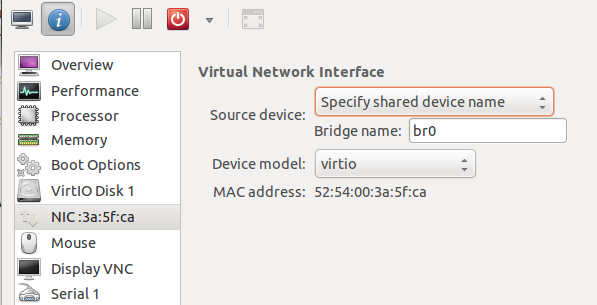 All you have to do is select the bridge created in the VM settings in virt-manager. ". What I tried instead was sudo setcap cap_net_admin=ei /usr/bin/qemu-system-i386. And then proceeded as directed. Perhaps you can add a section at the end to explain how to test that everything is working properly? When I try the approach above, my network stops working ie. my browser is no longer able to access common sites like Google. I reverted all the changes. I'm not sure what's wrong. I followed my How-To when I set up some 12.04 boxes and I don't remember having to change anything. That was a few months ago though. I'm using Virt-Manager and stuck after setting the bro interface. Your screenshot helps me. Thanks.